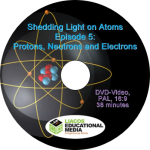 In Episode 5, Protons, Neutrons, and Electrons, we take a look at the three types of particles that make up atoms and describe how they are arranged within atoms. Using live demonstrations and outstanding animations, we then look back at the experiments that led to the discovery of these three particles. 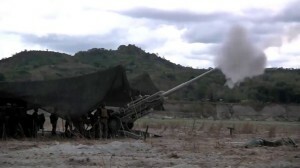 The preview video below contains a six-minute excerpt followed by a one-minute trailer. Part A: Introduction: We look back briefly at how the Periodic Table was developed and introduce the fact that atoms are made of three types of particles called protons, neutrons and electrons. Part B: Atomic Structure: We show that atoms are made of a central nucleus (which is composed of positively charged protons and neutral neutrons), which is surrounded by negatively charged electrons. 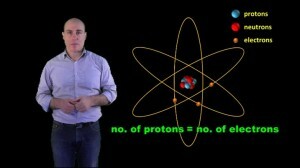 We explain that it is the number of protons in an atom’s nucleus which uniquely defines each atom. We also take a look at what isotopes are. Part C: The Discovery of Electrons: In the late 1890s, J.J. Thomson discovered electrons. 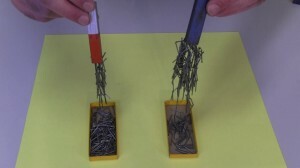 We explain how he did this by demonstrating some of the equipment he used in his lab. We also take a close look at static electricity. Part D: Alpha Particles: The discovery of radioactivity in the 1890s opened up a new window into the study of atoms and their structure. Part E: Rutherford’s Gold-Foil Experiment: In 1908, Ernest Rutherford used high-speed alpha particles (produced by radioactive radium) to probe into the structure of the atom and his experimental results changed our whole idea of what atoms were like. He discovered that atoms had a positively charged nucleus which was surrounded by orbiting electrons. Part F: The Discovery of Protons and Neutrons: We take a look at how, after the discovery of the nucleus, protons and neutrons were discovered. 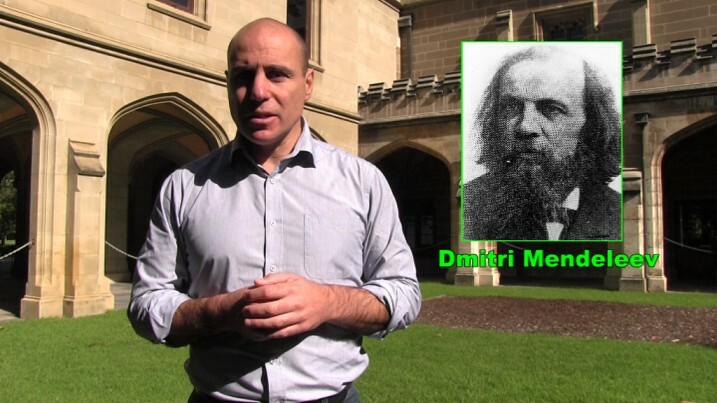 This is Dimitri Mendeleev. In the late 1860s and early 1870s, Mendeleev devised the periodic table of the elements. 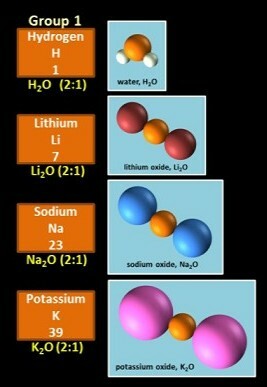 His Table organised the then known elements into groups, according to how they chemically react. When the elements in Group 1 reacted with oxygen for example they would produce oxides with a ratio of two atoms for every one oxygen atom. The metals also reacted with water in a very similar way. Using the patterns in the way that the elements reacted with oxygen… and with hydrogen, Mendeleev left gaps in his table, here and here for example, and predicted that these gaps would eventually be filled with elements that up until then had not been discovered. Gallium was discovered 4 years later and Germanium 15 years later. He was also able to predict some of the properties of the unknown elements, and his predictions were quite accurate. However, the table wasn’t perfect. For example, a Group 8 had to be included for the leftover elements that didn’t quite seem to follow regular patterns. But that doesn’t mean it was bad science. Science is all about trying to make sense of nature and every scientific advance gets us closer to the truth, and Mendeleev’s Periodic Table provided a brilliant platform from which further discoveries could be made. Our modern Periodic Table has sorted out the problems with the original Periodic Table, and each element now has a specific place within it. However, this arrangement of all the elements was only made possible with the discovery that atoms themselves were made up of even smaller particles called protons, neutrons and electrons and it’s these smaller particles that we’ll be looking at in this episode. So, before we look at how protons, neutrons and electrons were discovered, let’s have a look at what they are and how they’re arranged inside atoms. I should warn you though, that when it comes to atomic structure, you really need to know about 10 or so different things before any of it really makes sense, but you can only learn one thing at a time. Once you do learn the basics though, everything else is just examples and finer details. You’ll also need a good imagination: atoms are too small to be seen so they have to be imagined. Protons, neutrons and electrons are even smaller! We now know that all atoms are made of what’s called a nucleus, made up of two types of particles called protons and neutrons, which is surrounded by much smaller particles called electrons that move around the nucleus at enormous speeds. Protons and neutrons are often collectively called nucleons since they make up the nucleus. The plural of the word nucleus is either nucleuses or nuclei. Even though there are more than a hundred elements, the atoms of every single one of them are made up of just three types of particles, which are often called subatomic particles. 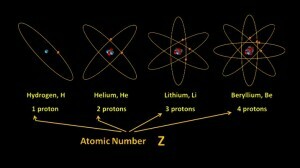 Different atoms have different numbers of these three subatomic particles. This atom has 2 protons and 2 neutrons in its nucleus which means it has 4 nucleons all together, and it has 2 electrons moving around the nucleus. 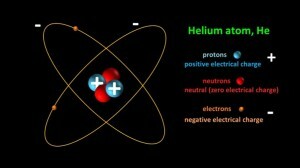 It is in fact a Helium atom or rather a representation of a Helium atom. We can’t actually see any of these particles and in this animation they’re not drawn to scale. The protons have a positive electrical charge and the electrons have a negative electrical charge. The neutrons are neutral. But what is electrical charge? Well, it’s a little like magnetism. Magnets have a North pole and a South Pole. Two North Poles repel one another, Two South Poles repel one another, while a north pole and a south pole attract one another. 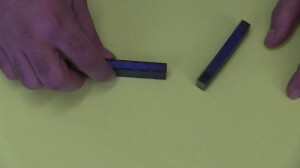 Some magnets can be very strong and provide a large force, while others are fairly weak. Electrical charge is similar but is described as being either positive or negative. The positively charged protons attract the negatively charged electrons and stop them from flying away. In that sense, it’s a little like the gravitational force of attraction between the sun and the Earth which keeps us orbiting the sun. The electrons don’t fall into the nucleus because they’ve got energy and they’re moving around the nucleus. Though the strength of magnets can vary, the size of the charge on all protons is exactly the same, and the size of the charge on all electrons is exactly the same. Also, the size of the positive charge on each proton is equal to the size of the negative charge on each electron, despite the fact that protons are much, much bigger than electrons. So why don’t the protons in the nucleus, which are all positively charged, repel each other and fly apart? Well, while most of us are familiar with the force of gravity, and with the forces associated with magnets and electrostatic charges, there is another force of nature with the somewhat unusual name of the “strong nuclear force”. This force acts between protons and neutrons within the nucleus and keeps them bound within the nucleus. We don’t really see it in everyday life, but without it, there wouldn’t be any atoms. Gravity and the Strong Nuclear Force are two of the four “fundamental forces of nature”. The third, Electromagnetism, is made up of magnetism and electrostatic forces, which appear to be different, but are in fact the same force when you get down to the atomic level. In everyday situations we talk about magnetic forces and electrostatic forces. The “weak interaction” is the fourth force of nature and, like the strong nuclear force, acts only at the atomic scale. In a pure sample of any given element, the number of positively charged protons, in this case three, equals the number of negatively charged electrons, so that, overall, the charge on the atom is zero since the positive charges on the protons exactly balance the negative charges on the electrons. However, atoms can often lose or gain electrons when they chemically react. We’ll have a look at how and when this happens in a later episode. In previous episodes, we were illustrating atoms as solid spheres, but it turns out that they’re not really solid at all. They’re mostly empty space. However, though atoms don’t have a clear outer boundary, the electrons are spinning around the nucleus so fast, that the atom effectively becomes, more or less, like a sphere. It’s a bit like the blades of a fan. 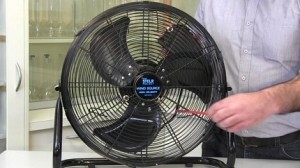 When the fan blades are still, they act like 3 distinct blades. When they’re moving though, it’s almost as if they become one solid disc-like unit. Even hydrogen atoms, which have only one electron are spherical. However, when they chemically join onto each other, there’s often a little bit of overlap. Atoms are defined by how many protons they have in their nucleus. By definition all hydrogen atoms have 1 proton in their nucleus, all Helium atoms have two protons in their nucleus, all lithium atoms have three, all beryllium atoms four and so on. The number of protons in the nucleus is referred to as the atomic number and is given the symbol Z (zed, or zee, if you prefer). Z stands for zahl which is the German word for number. Mendeleev based his Periodic Table on the relative atomic weights of the elements, that is, how heavy each atom is compared to hydrogen. However, our modern Periodic table organises the elements according to atomic number, which I’ll say again, is the number of protons in each atom. This produces a much better set of patterns in the physical and chemical properties of the elements. 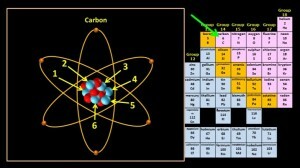 Carbon has an atomic number of 6, so every carbon atom, in the universe, has 6 protons in its nucleus. Here we’ve drawn all the electrons the same distance from the nucleus. In fact electrons occupy only certain energy levels, which are called electron shells, and only a specific number of electrons can occupy each shell. 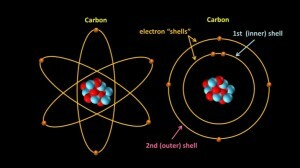 A carbon atoms has 2 electrons in its first, or inner, shell and 4 electrons in its second, or outer, shell. It’s much better to represent atoms with shells because the way the electrons are arranged in these shells plays a major part in the way that atoms chemically react. We’ll be taking a closer look at electron shells in our next episode. If you give it another proton and another electron, you don’t have a carbon atom with an extra proton and an extra electron, you actually have a nitrogen atom, with an atomic number of 7. Now, getting back to the nucleus, though all carbon atoms have the same number of protons, 6, they don’t all have the same number of neutrons. Most, 99% in fact, have 6 protons and 6 neutrons in their nucleus, resulting in a total number of 12 nucleons. About 1% though, are made of 6 protons and 7 neutrons, in other words 13 nucleons. A tiny number, 1 in every trillion or so, have 6 protons and 8 neutrons in their nucleus, a total of 14 nucleons. The total number of protons and neutrons, or nucleons, in an atom is called the atom’s mass number, and, somewhat confusingly in English, is given the symbol A. All these different forms of the same type of atom are called isotopes. Here we’re showing three isotopes of carbon. They all chemically react the same way, because they’re all carbon atoms (with 6 protons and 6 electrons). The number of neutrons does not affect the way that they chemically react. 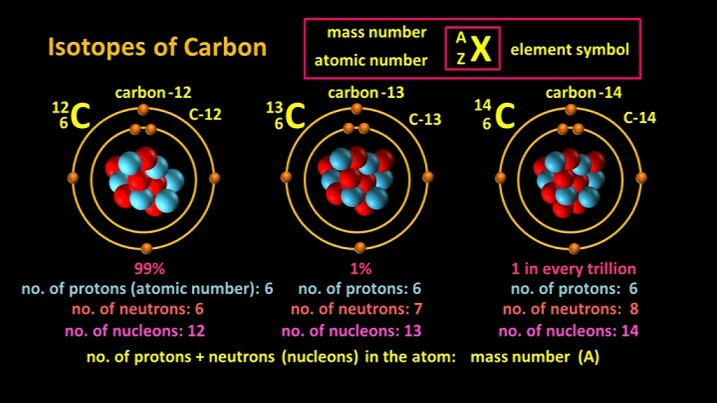 However, since all carbon atoms have 6 protons, we can also refer to each isotope of carbon as either carbon-12, carbon-13 and carbon-14, or, even more simply as C-12, C-13 and C-14. Another common practise, especially on web pages, is writing the atomic notation without the atomic number, as in 12C, 13C and 14C. The numbers are simply superscripts. Now I should just mention, even though it’s probably already obvious, that the number of neutrons in a nucleus is equal to the atom’s mass number minus the atom’s atomic number. 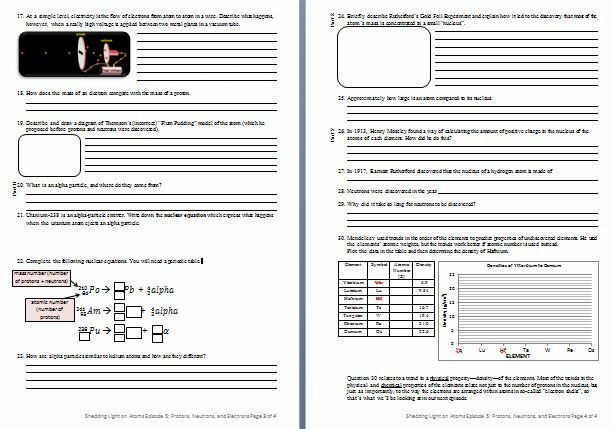 Let’s look at one more example of using atomic notation where the atomic number, mass number, and the element’s atomic symbol are shown. is a particular isotope of beryllium. Its atomic number is 4, which means it has 4 protons, which we’ve coloured blue. It also has 4 electrons. Its mass number is 9, which means that it has 9 protons and neutrons in total. Four of them as I said are protons and five of them (9 minus 4) are neutrons. 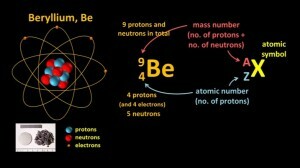 Since all beryllium atoms by definition have 4 protons, this isotope can also be written as Beryllium-9 or Be-9. It’s also sometimes written as 9Be (on webpages and elsewhere because it’s a little easier to format with just the one superscript). As I said, isotopes of any given element all chemically react the same way. 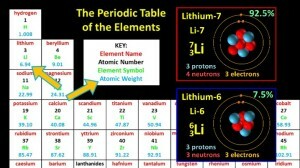 A typical sample of Lithium is made of 92.5% Lithium-7 atoms (each with 3 protons and 4 neutrons in their nucleus) and 7.5% Lithium-6 atoms, but both Lithium-7 and Lithium-6 react with water in the same way, because it’s the protons and electrons in the atom that determine the way something chemically reacts. However, the number of neutrons can affect whether a nucleus is stable or radioactive. 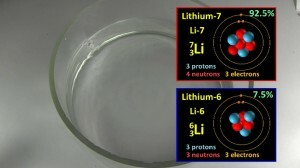 Both isotopes of Lithium which occur naturally are stable. C-12 and C-13 are stable, but C-14 is unstable, that is, it’s radioactive. We’ll take a brief look at radioactivity a little later in the program. Many Periodic tables include what’s called the element’s atomic weight. This number, for example 6.94 for Lithium, reflects the fact that most elements are made of different isotopes. It’s basically an average (of the relative atomic weights of all the different isotopes). Rounding the atomic weight up or down to the nearest whole number, will usually tell you the mass number of the element’s most common isotope. So how were protons, neutrons and electrons discovered? Well, as was the case with the discovery of atoms, it wasn’t with some machine that could suddenly see them. Just as the discovery of atoms occurred after many many experiments and observations, so too the realization that atoms were made of protons, electrons, and neutrons came only after scientists had conducted many many experiments and had made lots and lots of observations. Based on their experiments, scientists slowly built up a picture of what atoms were like. So let’s have a look at some of the experiments. If I rub this balloon on my shirt, the balloon becomes electrically charged and it can attract small pieces of paper. I can also change the direction of this stream of water. Ancient Greek philosopher Thales first reported these mysterious effects and forces in about 600BC. In his experiments, he used a type of fossilized tree resin called amber, which in Greek is called electron. More than 2000 years later, in about 1600AD, English scientist William Gilbert started using the word “electric” to describe these forces. In the 1700s French scientist Charles du Fay discovered that there were two types of electric charges which we now call positive and negative. 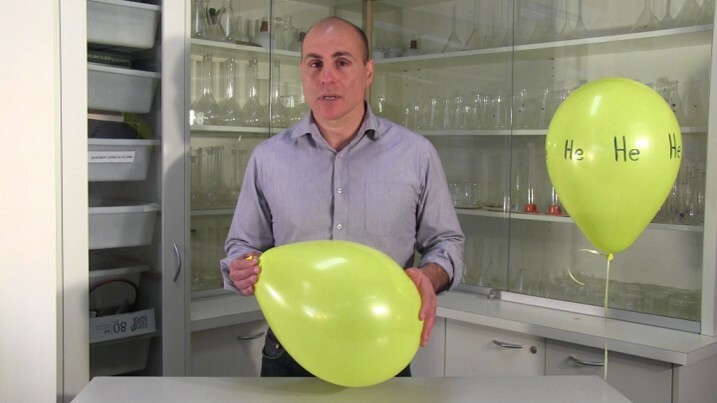 Two objects that have the same charge repel one another (both of these balloons are negatively charged), but two objects that have opposite charges attract one another. 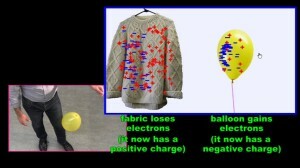 The balloon has a negative charge but my jeans have a positive charge. By the 1890s, batteries, generators, light globes, electric motors, the telegraph, the telephone and lots of other things that used electricity had been invented. 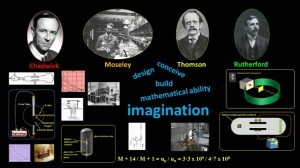 However, no-one knew what electricity actually was until 1897, when English scientist J.J. Thomson discovered electrons. He was experimenting with the flow of electricity in glass tubes which had had all their air sucked out. He used an induction coil to generate a voltage of many thousands of volts. 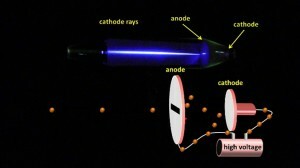 When this really high voltage was applied between what was called the cathode and what was called the anode, rays of … something, we now know that they were electrons, were emitted from the cathode and moved towards the anode. The rays were therefore originally called cathode rays. Though most of the cathode rays slammed into the anode, a small slit allowed some of them to travel through it towards the fluorescent screen which lit up when the cathode rays hit it. Thomson’s discoveries would not have been possible if high-quality pumps had not been invented. To study electrons (and, as we’ll see, other subatomic particles) properly, you need a vacuum tube. Every little invention and discovery leads to more inventions and discoveries. Now it didn’t matter what metal he used for his cathode, the rays were always the same. Thomson then suggested that these rays were made of tiny particles which were coming from inside the atom and which were in fact part of every atom. 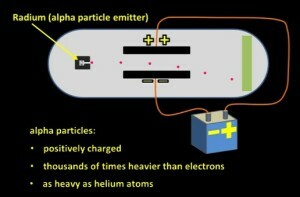 Thomson named these particles electrons. Atoms, which were thought to be the smallest units of matter, were themselves made up of even smaller particles. Placing a magnet near the moving electrons deflected their path, as did electrically charged plates, and Thomson worked out that electrons are negatively charged. By measuring how much the electrons deflected, Thomson was able to show that the mass of an electron is tiny compared even to the mass of a hydrogen atom, which is the lightest of all atoms. Further experimentation eventually revealed that the mass of an electron is about 1/2000 of the mass of a proton. Now since electrons were negatively charged, Thomson reasoned that the rest of the atom had to have a positive charge, so that, overall, the atom would be neutral. He proposed what was later called Thomson’s Plum Pudding Model of the Atom. A “model” in this sense is an idea or a representation of something. Atoms were composed, Thomson said, of a stationary positive blob or something, he didn’t know what, which contained negative electrons scattered throughout it, a little like a traditional English pudding with raisins mixed in, the raisins being the electrons. It could just as easily have been called the fruit cake model of the atom, that’s what I’m actually holding, it’s similar to a pudding, or the date scone model of the atom, or the blueberry muffin model of the atom. The positive charge of the blob was exactly equal to the overall negative charge of the electrons, so atoms are normally neutral, Thomson said. However the positive blob was stationary while the electrons moved freely around the atom. Thomson’s discovery of electrons helped explain current electricity; electricity was the flow of these electrons from atom to atom in a conductor when a voltage is applied. The positive part of the atom always stayed where it was but the electrons, being lighter, could move from atom to atom (although as we’ve seen, if you can generate tens of thousands of volts, electrons can be forced to jump off a metal plate and move towards another one even if there’s nothing between the two plates). 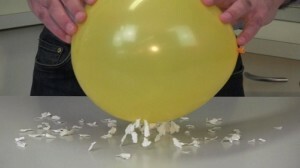 It also helped explain static electricity. Normally the amount of positive charge on something is exactly equal to the amount of negative charge on it. When some things are rubbed together they can sometimes either gain electrons which gives them an overall negative charge, or they can lose electrons which gives them an overall positive charge. This produces a force of attraction between them. 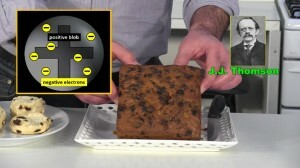 However, Thomson’s Plum Pudding model of the atom did not really accurately represent what atoms are like. More discoveries would soon follow. In 1895, French scientist Henri Becquerel discovered that certain elements gave off a mysterious form of radiation that could expose photographic film. Before the invention of digital cameras, film was used to record images. When film was exposed to ordinary light, typically in a camera, it darkened and formed an image. However, though Becquerel’s newly discovered rays were invisible to the eye, they could still expose film, even if the film was covered in opaque black paper, which we’re not showing here. The rays, which were produced by uranium, could obviously pass through the paper. Of course the rays radiated out in every direction, but we’re only showing the ones moving towards the film. 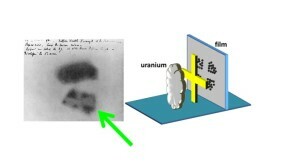 Becquerel then placed a metallic cross between the uranium and some covered film, remember, the rays couldn’t be seen, and a few days later developed this image, where the outline of the cross was visible. The rays could penetrate the black paper but not the metal of the cross. So what were these rays? We now know that many elements with large atoms, like uranium, thorium and radium emit what are called alpha particles from their nucleuses. A Uranium-238 atom for example (here we’re not showing any of its electrons) is one of the heaviest types of naturally occurring atoms on earth. It has 92 protons and 146 neutrons in its nucleus, so a combined total of 238 nucleons. But this many protons and neutrons is unstable and so the nucleus ejects, at really high speeds, what is called an alpha particle, a group of 2 protons and 2 neutrons. It’s never 2 protons and 3 neutrons, or 1 proton and 2 neutrons, or any other combination; it’s always 2 protons and 2 neutrons. After emitting the alpha particle, our original U-238 atom is no longer a U-238 atom. Instead of having 92 protons, it now has only 90, and since it has lost 2 neutrons as well, it now has only 144 neutrons, resulting in a total of 234 nucleons. So, what kind of atom has 90 protons in its nucleus. Looking at the periodic table, we can see that it’s a thorium atom. 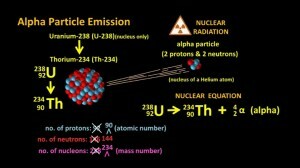 Our Uranium-238 atom has turned into a thorium atom, specifically, a thorium-234 atom by emitting the alpha particle. Since the alpha particle has 2 protons, it is in fact identical to the nucleus of a helium atom, a really fast-moving nucleus of a helium atom. Since alpha particles come from the nucleus of the uranium atom, alpha particles are a form of nuclear radiation and uranium is said to be radioactive. The alpha particle is given the symbol alpha ( ), which is the Greek letter “a”, pretty much the same as an English “a” but drawn with curvy lines to distinguish it. The atomic number of the original atom has dropped by two since two protons have been ejected, and the mass number has dropped by 4, since 4 nucleons overall were ejected (2 protons and 2 neutrons). In the early 1900s, New Zealand-born Ernest Rutherford set out to investigate the rays that Becquerel had discovered. He found that there were in fact three different types of nuclear radiation, which he named alpha, beta and gamma radiation (after the first three letters of the Greek alphabet), and that they had all played a part in exposing the photographic film in Becquerel’s experiments. It turns out that the Uranium atoms were giving off alpha-particle radiation and gamma rays, but the thorium atoms that that the uranium atoms were turning into were giving off beta-particle radiation and gamma rays. 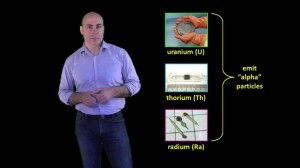 The thorium atoms were also slowly turning into different atoms which were also radioactive! It further turns out that some isotopes of some elements are alpha emitters, while some isotopes of the same element are beta emitters. Some elements only have radioactive isotopes, some have both stable and radioactive isotopes, and some only have stable isotopes (not including artificial isotopes produced in laboratories or nuclear reactors, most of which are radioactive). Radioactivity is a really big topic! Right now though we’re only focussing on alpha particles. In 1898, Polish scientist Marie Curie discovered radium. Radium was much much more radioactive than uranium, producing far more alpha particles per second than uranium did. Research into alpha particles and atomic structure was therefore made a lot easier. Rutherford placed the newly discovered element into a metal container that had a small hole in it. The alpha particles that the radium was producing came streaming out of the hole in a kind of beam, which Rutherford directed towards the space between two metal plates that were connected to a strong battery. The alpha particles deflected towards the plate attached to the negative side of the battery, so it was realized that they were positively charged. Alpha particles also did not deflect anywhere near as much as electrons did when electrons were fired past charged metallic plates, and it was calculated that they must have been thousands of times heavier than electrons. In fact alpha particles were about as heavy as helium atoms. 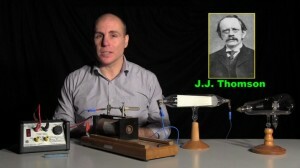 This technique of firstly measuring the amount of deflection of charged particles as they flew past charged metallic plates or magnets and then, from those measurements calculating the particle’s mass, had been developed by JJ Thomson a few years earlier. It’s called mass spectrometry, and, over time, it improved to the point where we can now measure the mass of atoms and molecules really accurately. It works on the basic principle that heavier objects don’t deflect as much as lighter objects if a sideways force acts on them. So, what were alpha particles? In 1907, Rutherford placed radium inside a thin glass tube, which itself was placed inside another glass tube which had no air in it. 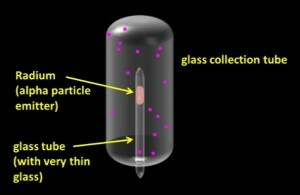 He allowed the alpha particles emitted by the radium to collect inside the larger glass tube, and, after a few days, was able to demonstrate that helium gas had accumulated inside the tube. Through collisions with the atoms of the glass, the alpha particles had picked up some electrons to become helium atoms. We now know, as I said earlier, that alpha particle are in fact the same as the nucleus of helium atoms, having two protons and two neutrons just like helium atoms. Alpha particles are ejected from the nuclei of certain radioactive elements. Alpha particles can’t penetrate our skin, but they can be very harmful to us if they’re emitted by an alpha emitter inside our bodies, because they can crash into the various molecules in our cells and cause them to stop chemically reacting properly, which can lead to the cells dying or turning cancerous. Once they slow down and pick up a few electrons though, they turn into Helium atoms and they’re harmless. (having sucked in some helium and talking with a high-pitched voice) Most of the helium atoms on Earth in fact were originally alpha particles which acquired electrons to become Helium atoms. The discovery of protons and neutrons though and the fact that atoms had a nucleus, only came after Rutherford’s next series of experiments, which were by far his most famous. A quick note about mass spectrometry, which is only briefly explained in the video. It’s a difficult concept until students learn about ionization, which is the process by which atoms lose or gain electrons and therefore become charged. In 1912, Thomson injected neon gas into a small chamber, and, with a high voltage electron gun, blasted the gas with electrons. The electrons from the electron gun struck the electrons of the neon atoms and knocked one or two of them out, so the neon atoms ended up being positively charged (since they now had more protons than electrons, although at that stage, protons had not been discovered). These charged neon atoms could then be accelerated by charged metallic plates into a tube which was surrounded by electromagnets. This caused the neon atoms to deflect from their original path. 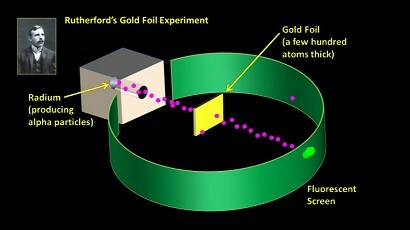 However, Thomson found that the deflection produced two different streams of atoms. Clearly, there were two types of neon atoms! The heavier type deflected less than the lighter type, and by doing some fairly complicated mathematics, Thomson showed that they had a relative atomic weight of 20 and 22. These two isotopes are neon-20 (neon-20 atoms make up about 90% of all neon atoms) and neon-22 (neon-22 atoms make up about 10% of all neon atoms). We now know neon-21 atoms also exist but make up only about 0.3% of all neon atoms. Mass spectrometry is now fairly easy to perform and it can accurately determine the exact mass of atoms and molecules! In terms of working out what atoms were like, alpha particles proved to be invaluable. Rutherford realized that because alpha particles could pass through very thin sheets of metal, he could use them as a kind of high speed bullet to probe into atoms. J.J. Thomson had proposed that atoms consisted of a positive sphere of something which had electrons embedded in it. Hoping to discover how the electrons and the positive…something were arranged within atoms, Rutherford began a series of experiments in 1908 where he directed a stream of alpha particles towards a very very thin layer of gold foil that was only a few hundred atoms thick. To detect the path of the alpha particles he used a screen which would light up whenever an alpha particle hit it, very similar to the screen I showed you earlier that lit up when electrons hit it. Each flash of light is called a “scintillation”. His equipment was about the size of a pot. Why did Rutherford use gold? He actually tried different metals but found that gold was best because it could be flattened into the thinnest sheets. Gold is the most malleable of all metals. If Thomson’s Plum Pudding model of the atom was accurate and there was a positive sphere with negative electrons spread evenly throughout it, then the alpha particles wouldn’t deflect much. However, Rutherford found that while the vast majority of alpha particles did pass straight through the gold foil with very little deflection, a small proportion were deflected by large amounts, and some even bounced back in the direction from which they had come. In 1911, Rutherford used the results of his experiments to calculate that a tiny positively charged nucleus exists at the centre of the atom and that the even tinier negatively charged electrons swarm around it. Most of the mass of the atom was concentrated in the nucleus. The alpha particles could pass through the thin gold foil because of the fact that atoms are mostly empty space and electrons are very light. However, when the positively charged alpha particles occasionally passed close to the positively charged nucleus, they were deflected. This arrangement of the atom was called Rutherford’s Planetary Model, because it looked a little like our Solar System, where the sun is at the centre and the planets orbit around it. Since only a tiny fraction of alpha particles were deflected, Rutherford proposed that the nucleus must be tiny compared to the overall size of the atom. We now know, based on similar experiments but with a higher accuracy, that the nucleus has a diameter of only about 1 100,000th of the diameter of the atom itself. If this sticker, which has a diameter of 1cm, was the size of the nucleus, the diameter of the whole atom would be about 1 kilometre (100,000cm). 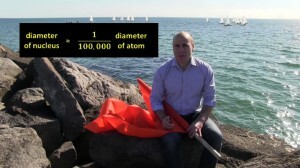 If I place the 1cm wide sticker, representing the nucleus, onto this flag and then hold the flag up, the camera has to be a long, long, long long long way away if we want to fit the whole atom in the shot. 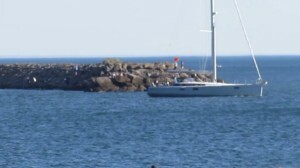 And once we’ve zoomed right out, you can’t even see the flag let alone the nucleus. The diagrams we draw of atoms, are totally not to scale, not even close, but there is no way around it. If the atom was drawn to scale, the nucleus and electrons would be too small to see. So, the existence of a positively charged nucleus surrounded by negatively charged electrons was established, but what was the nucleus made of? How were the nucleuses of, for example, tin atoms different to the nucleuses of zinc atoms. 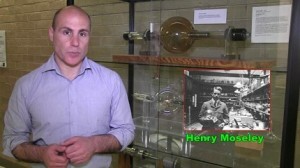 In 1913, British scientist Henry Moseley, using X-ray tubes like these ones here, discovered a way of finding the exact charge in an atom’s nucleus and how many electrons the atom had. We’ve already seen how high voltages can produce streams of electrons. It had been discovered that when high-speed electrons crash into atoms, X-rays are produced. Moseley fired electrons at Aluminium (or aluminum if you prefer) and measured the frequencies of the X-rays that were produced. He then replaced the aluminium with silicon (which came next on the periodic table), and found that the set of X-rays produced by the silicon had different frequencies. He repeated the experiment with most of the elements up to gold. He found that every element produces X-rays with a unique set of frequencies, and that there was a pattern in the way that the frequencies changed from element to element. This allowed him to determine how much charge each nucleus had. He was able to state that, “We have here a proof that there is in the atom a quantity which increases by regular steps as one passes from one element to the next. This quantity can only be the charge on the central positive nucleus.” Henry Moseley, Philosophical Magazine, Vol. 26, 1913, p1030. He found that, for example, if the nucleuses of the lightest atoms, that is hydrogen atoms, have a positive charge of exactly 1 unit, then the nucleuses of helium atoms have a positive charge of exactly 2, the nucleuses of lithium atoms have a charge of exactly 3, and so on. It then became clear that hydrogen atoms had to have one electron, which has a charge of negative one, helium atoms had to have two electrons, lithium atoms three electrons, and so on. 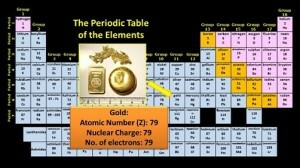 Gold atoms, the heaviest atoms he tested had a nucleus with a positive charge of exactly 79 and they had 79 electrons. Moseley found that none of the known elements had a charge of 43, 61, 72 or 75 and he predicted that these elements would eventually be discovered. Hafnium was discovered 10 years later, Rhenium 12 years later, Technetium 23 years later and Promethium 32 years later. Once again, we can see how the discovery of patterns in nature, can lead to even more discoveries. As a result of Moseley’s work, the Periodic Table, which had been organised on the basis of each element’s atomic weight, was modified and the elements were placed in order of atomic number. We now know that the charges in the nucleus relate to how many protons the nucleus has. 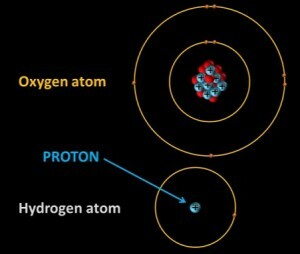 A hydrogen atom has one proton in its nucleus, a helium atom has two protons and so on, but how were protons discovered? Well, it wasn’t easy, but it kind of involved playing pool, atomic pool, using alpha particles as the cue ball. 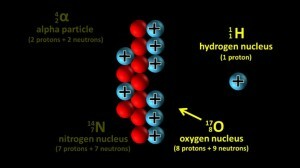 In 1917, Rutherford fired alpha particles into nitrogen atoms and found that oxygen and hydrogen atoms were produced. He had managed to split the nitrogen atoms into two new atoms in the world’s first controlled nuclear reaction. He reasoned that hydrogen atoms, being the lightest atoms, must have in their nucleus a single positively charged particle, which he named the proton. The proton we’re showing here was originally part of the nucleus of the nitrogen atom but was broken off when the alpha particle struck it. Protons, Rutherford said, must be the building blocks of the nucleuses of all atoms. Since the nucleus of every oxygen atom has a charge of positive 8, then it must have 8 protons in its nucleus. We now know (although they didn’t at the time) that in Rutherford’s experiment, the nitrogen atom’s nucleus, made of 7 protons and 7 neutrons, here we’ve drawn them in two neat rows so that you can see them more easily, was struck by an alpha particle, made of two protons and two neutrons, and a single proton was knocked off it leaving behind an oxygen atom that had 8 protons and 9 neutrons in its nucleus. However, though the proton had been discovered, the neutron had not been, so there was still a major part of the atom that was unaccounted for (in 1917 when Rutherford performed his experiment). 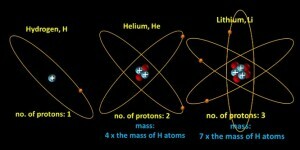 Helium atoms, for example, with two positively charged protons, were actually four times heavier than hydrogen atoms and Lithium atoms, with three protons, were seven times heavier than hydrogen atoms. Rutherford therefore suggested that there was probably some other particle inside the nucleus that hadn’t been detected yet, and that it probably had a mass similar to the mass of the proton. Remember, most of the mass of the atom is in the nucleus. The mass of electrons is practically zero compared to the mass of protons, though they have an equally sized but opposite charge, and neutrons, we now know are uncharged but have a similar mass to protons. Neutrons, it turns out, were really hard to detect because they’re uncharged. Their lack of charge means that they don’t get deflected by electric or magnetic fields and they don’t produce flashes of light when they hit fluorescent screens like electrons and alpha particles do. Neutrons were finally discovered by English scientist James Chadwick in 1932, more than a decade after protons were discovered, in quite a complicated experiment that was also a little like atomic pool (or snooker or billiards). It had been discovered that polonium emits particularly fast alpha particles, which produced, when they crashed into beryllium atoms, a form of radiation that had a really high penetrating ability. We now know that the radiation was actually made of fast-moving neutrons that were being knocked out of the beryllium nuclei when the alpha particles coming from the polonium crashed into them. Though the radiation could not be detected directly with any scientific instruments, they knew that it was being produced because when it was aimed at, for example, hydrogen atoms, whatever it was made of would very occasionally strike the nuclei of the hydrogen atoms and send electrons and protons flying off at high speeds, and these could be detected relatively easily. No-one knew what the radiation was initially, but Chadwick provided an answer. He lined up polonium, a beryllium target, some paraffin wax which is what most candles are made of (it’s a compound made of carbon and hydrogen atoms), and finally an electrical device called a valve counter, which could detect electrically charged particles. The valve counter was very similar to a Geiger counter, which here is detecting alpha particles coming from a tiny speck of americium-241, an alpha-emitter found in most types of smoke detectors. So why did alpha particles knock protons out of nitrogen atoms and neutrons out of beryllium atoms? Why didn’t neutrons get knocked out of nitrogen atoms? Well, I’m not really sure! But Rutherford and Chadwick (and others) were bombarding lots of different atoms with alpha particles to see what would come up. It just so happens that the particular experiments we mention in the video were the ones that produced information about protons and neutrons. Chadwick basically bombarded the nuclei of the beryllium atoms with alpha particles which knocked out neutrons that then went crashing into the paraffin wax. Some of the neutrons scored a direct hit on the nuclei of the hydrogen atoms in the paraffin wax, which remember are just protons. The struck protons then went flying into the valve counter. Chadwick first measured the energy of the protons and was then able to show that they had accelerated the way they did because they had been struck by neutral particles that had a similar mass to protons. In other words, he had established the existence of neutrons, and the value he found for their mass was out by only about 0.1% of the currently accepted value. So, all three basic components of the atom were now known, and over time their mass has been measured pretty accurately. How brilliant were Chadwick, Moseley, Thomson and especially Rutherford among many others?! They could conceive of, and then design and build all this technical equipment, and they had the mathematical ability to interpret the results of their experiments, and they had the imagination to picture all these subatomic particles that make up atoms. Imagination is just as important as knowledge. However, as I said earlier, electrons don’t just circle the nucleus in any old position. In the 1910s and 1920s scientists figured out that electrons could occupy only certain fixed energy levels called electron shells, which are usually represented as circles and only a certain number of electrons could fit in each shell. This discovery was the real key to understanding how atoms bond together to form compounds like, for example, water and salt, so it’s electron shells that we’ll be looking at in our next episode. See you then. 1. For a long time people thought that the smallest particles in nature were atoms. We now know that atoms are made of _____________, ______________, and ________________. 2. Mendeleev organised the elements into Groups based on similarities in the way that they behaved chemically. For example, the atoms of the elements within each Group form compounds with oxygen atoms only in specific ratios. Fill in the table below. The first row has been done for you. 3. Label the diagram below. 4. We can tell it is a representation of a _______________ atom because it has ________ protons in its ________________. If it had 3 protons in its nucleus it would be a _______________ atom. 5. ________________ have a ________________ charge, ________________ have a ________________ charge, and ________________ are neutral. 6. Why do the electrons keep moving around the nucleus instead of flying off away from it? 7. Why don’t the protons, which all have the same positive charge, repel each other and fly apart. 8. What stops us from flying off into space every time we jump into the air? 10. How does the number of protons in an atom compare to the number of electrons in an atom? 12. A particular atom has a mass number (given the symbol _______) of 56. What does this mean? 13. While all the atoms of any given element have the same number of protons, they don’t all have the same number of neutrons. To distinguish between the isotopes of different atoms, scientists often use “atomic notation”. 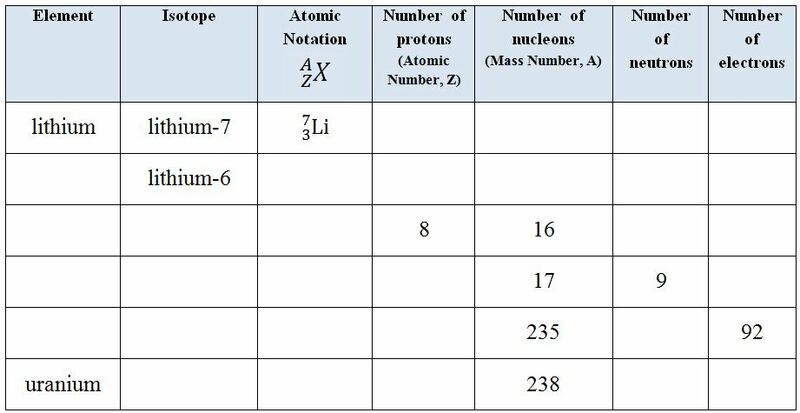 How many protons, neutrons, and electrons are in the following atoms. 14. , , and . are all naturally occurring isotopes of carbon. Write down three things that they all have in common and describe one thing that is different about them. 15. Fill in the table below. You will need a periodic table. 16. 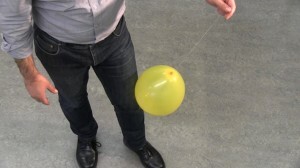 Two balloons are rubbed on cloth and it is then found that they repel one another. Why does this happen? 17. At a simple level, electricity is the flow of electrons from atom to atom in a wire. Describe what happens, however, when a really high voltage is applied between two metal plates in a vacuum tube. 18. 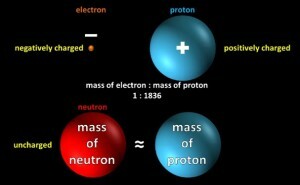 How does the mass of an electron compare with the mass of a proton? 19. Describe and draw a diagram of Thomson’s (incorrect) “Plum Pudding” model of the atom (which he proposed before protons and neutrons were discovered). 20. 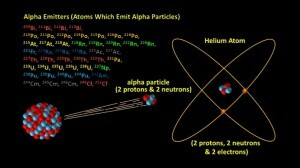 What is an alpha particle, and where do they come from? 21. 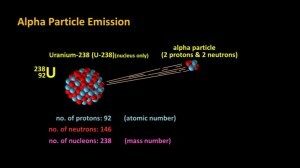 Uranium-238 is an alpha-particle emitter. Write down the nuclear equation which express what happens when the uranium atom ejects an alpha particle. 22. 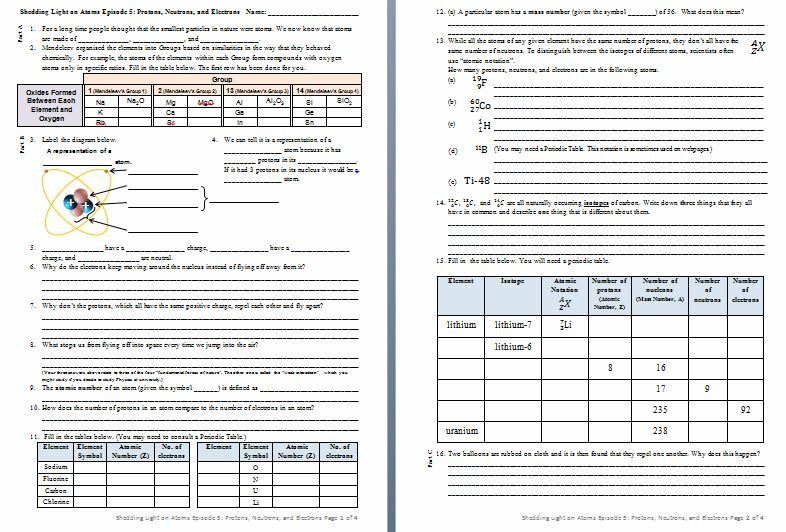 Complete the following nuclear equations. You will need a periodic table. 23. How are alpha particles similar to helium atoms and how are they different? 24. Briefly describe Rutherford’s Gold Foil Experiment and explain how it led to the discovery that most of the atom’s mass is concentrated in a small “nucleus”. 25. 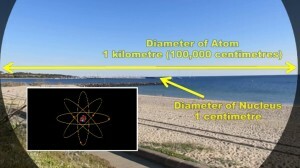 Approximately how large is an atom compared to its nucleus. 26. In 1913, Henry Moseley found a way of calculating the amount of positive charge in the nucleus of the atoms of each element. How did he do this? 28. Neutrons were discovered in the year _____________. 29. Why did it take so long for neutrons to be discovered? Photos of the elements (gold, germanium, gallium, radium, beryllium, hafnium and rhenium) © Heinrich Pniok. Used with permission. Visit http://pse-mendelejew.de/en/ to see originals. Heinrich’s photos of the elements are arguably the best collection on the internet. See also http://commons.wikimedia.org/wiki/User:Alchemist-hp?uselang=fr. The Clip Art used in this program was created by Microsoft. Amber hg.jpg (http://commons.wikimedia.org/wiki/File:Amber_hg.jpg) by Hannes Grobe is licensed under CC-BY-SA-2.5. Djurgårdsbrunnskanalen 1905a.jpg (http://commons.wikimedia.org/wiki/File:Djurg%C3%A5rdsbrunnskanalen_1905a.jpg) by Holger.Ellgaard is licensed under CC BY-SA 3.0. Old field camera.jpg (http://commons.wikimedia.org/wiki/File:Old_field_camera.jpg) byArne Nordmann (norro), Germany, is licensed under CC BY-SA 3.0. Potassium water 20.theora.ogv (http://commons.wikimedia.org/wiki/File:Potassium_water_20.theora.ogv) byOzone aurora / Philip Evans is licensed underCC BY-SA 3.0. 3D anamation of the Rutherford atom.ogv (http://en.wikipedia.org/wiki/File:3D_anamation_of_the_Rutherford_atom.ogv) by Damek (David Marin) is licenced under CC BY-SA 3.0. 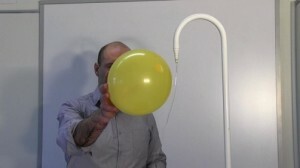 Balloons and Static Electricity (simulation) (http://phet.colorado.edu/en/simulation/balloons) by PhET, University of Colorado is licensed under a Creative Commons Attribution 3.0 United States License. 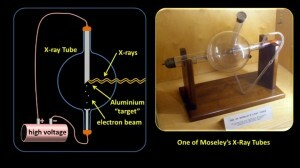 Moseley x-ray tube.jpg (http://upload.wikimedia.org/wikipedia/commons/f/f7/Moseley_x-ray_tube.jpg) by Anders Sandberg is licensed under Creative Commons Attribution 2.0 Generic. Promethium and Polonium images by http://images-of-elements.com/ is licensed under Creative Commons Attribution 3.0 Unported License. Special Thanks to the University of Melbourne School of Physics. So how many facts have we covered so far. Electrons orbit around the nucleus. The atom is therefore mostly empty space. The protons are positively charged and the electrons are negatively charged, so there is a force of attraction between them. This force is called electromagnetism. The electrons don’t spiral into the nucleus because they’re moving. The electrons spin around so fast that an atom is effectively more-or-less spherical. Protons are about 1840 times more massive than electrons are. Neutrons, which are neutral, have about the same mass as protons. Most of the mass of the atom is concentrated in the nucleus. Even though the protons repel one another, they’re held in place by a force that’s called the Strong Nuclear Force. 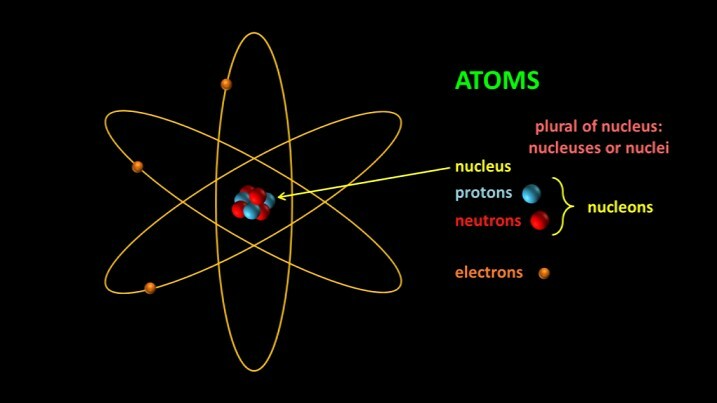 The number of protons that are in an atom’s nucleus defines the type of atom that it is. ALL carbon atoms have 6 protons in their nucleus. The neutron number can vary. There are three naturally occurring isotopes of carbon. About 99% have 6 protons and 6 neutrons, about 1% have 6 protons and 7 neutrons, and about 1 in a trillion have 6 protons and 8 neutrons. Some nuclei are unstable and give off nuclear radiation. Uranium-235 atoms for example emit alpha particles and turn into Thorium atoms. (you might be the one to discover it one day!